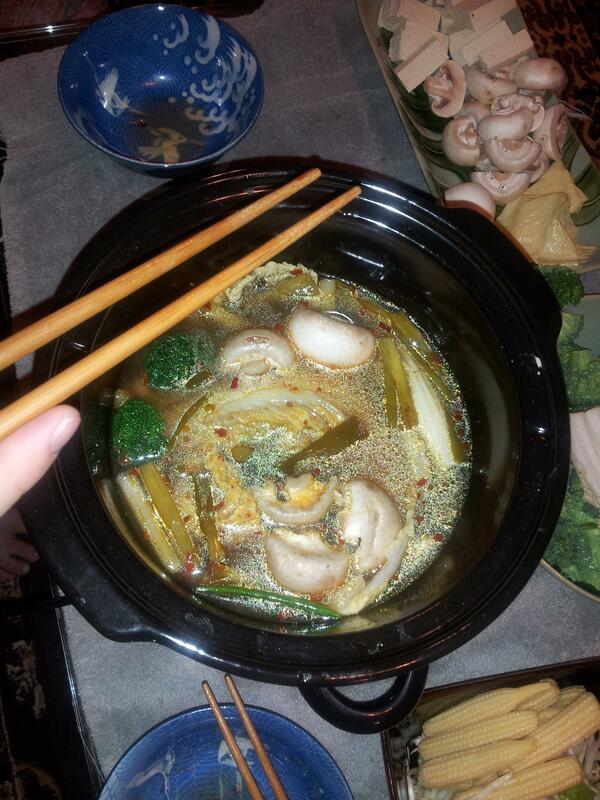 When Brent and I are feeling particularly lazy but still want to eat something healthy, we make hot pot. This is an East Asian fun thing that can be enjoyed by small groups of friends or just your family. We use a simple electric wok that’s resistant to tipping over and fill it with our favorite kind of broth. 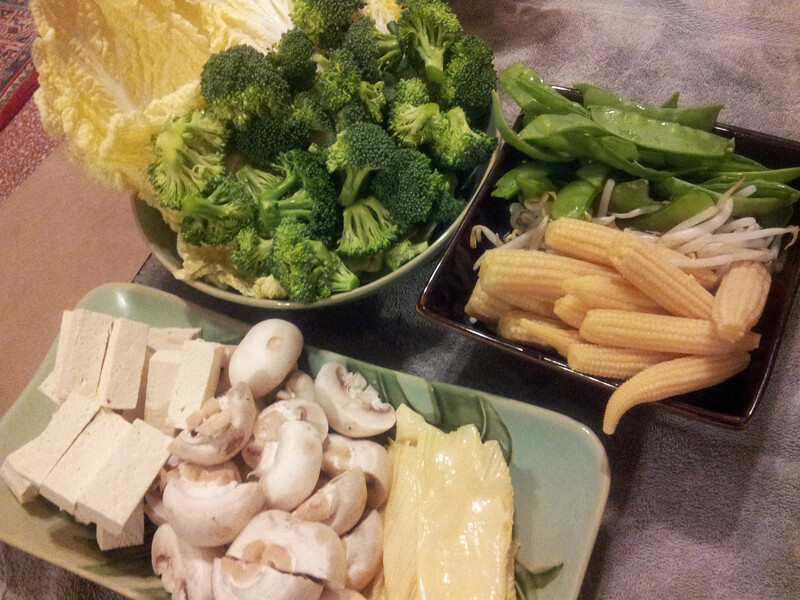 It’s a great way to use just about any vegetables that are available in our refrigerator – broccoli, green beans, baby corn, bamboo shoots, water chestnuts, bean sprouts, tofu, tofu skins, mushrooms, snow peas, broccoli, carrot, cauliflower, noodles (we use thin rice noodles and konjac noodles). Napa cabbage, spinach and Romaine lettuce are favorites. I combine everything but the scallion onions in my pot and boil for 30 minutes or more until it’s fragrant and steamy. Then I add the spring onions and take the pot to our table. You put the veggies into the soup pot and wait for the liquid to return to a boil. Then we remove the vegetables without chopsticks, wait for them to cool or dip them in sauce or not (I like a home-made chili-lime-peanut sauce, Brent prefers a garlic chili sauce) and DEVOUR! Just be careful that the hot liquid doesn’t splash anyone and that the contents don’t spill onto anyone. It’s HOT (hence the name *hot* pot)! This might not be a dish for the faint of heart, but it is for the hungry, adventurous and lazy. Just put down a towel for all the drips and splashes. As versatile as this particular dish is, there’s something for everyone. Just don’t get hurt when you realize someone ate your mushroom. but how different their reaction is when they. home growing, coupled with the produce of cheap, healthy vegetables. garden shredder so they decompose quicker than normal.